Check Out Our New VITA 67.3 Product Line Offering! SV has released our line of VITA 67.3 products! VITA 67.3 is the customizable RF version for your embedded systems application. WEST PALM BEACH, Fla. - Sept. 7, 2018 - PRLog -- SV Microwave now offers the complete line of VITA 67 coaxial/RF products. SV's unique connector retention mechanism makes installing and removing a lot easier than competition! SV's floating SMPM coaxial contacts ensure excellent RF performance in any mating condition. These parts are also designed for side-by-side implementation with VITA 46 hardware and can be cabled to Ø.086 and smaller coaxial cable types. 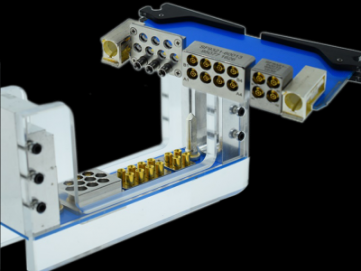 The VITA 67.3's high reliability, density, and ruggedness make it perfect for applications such as high speed coax solutions, aerospace & defense applications, SIGINT, EWR, ground base station & communication systems, and Air Transport Racks (ATRs) without Rear Transition Modules (RTMs) or limited speed through RTM. • SMPM min pitch .228" and SMPS min pitch .155"
SV Microwave has More Coaxial PCB Connectors Available through Distribution than Ever Before!